Click the button below to add the Website Design to your wish list. After receiving the above information, one of our Web Designers will call to review your site data with you and discuss any changes that you'd like to see made. When your website is done, (normally within 5 days), after your approval, your site will go live! We will take care of submitting your website's address to the most popular search engines so that your site can get found online. You can update your website content when ever you need to or, if you'd like for us to help you keep your website up to date, you can purchase a Raven Web Maintenance Package. 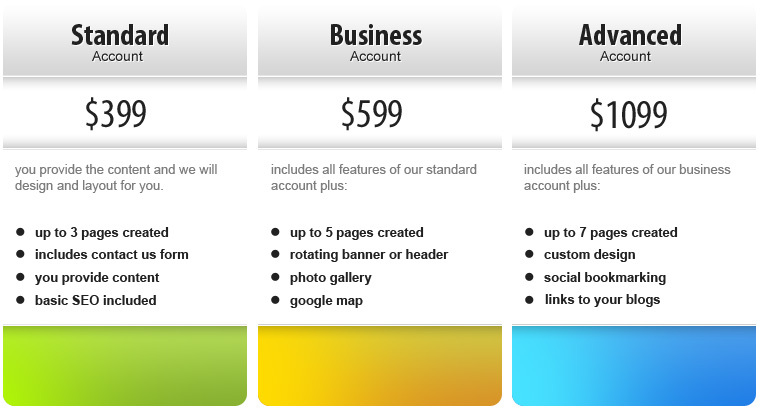 The Basic Online Presence Web Design Package costs $399. Custom design work like logo creation, graphics or illustrations will be charged separately. Compared to our other web design packages, this package offers a quick, easy, affordable way to create an online presence for your organization. The Online Presence Plus Web Design Package costs $599. Additional design work like logo creation, graphics or illustrations will be charged separately. Compared to our other web design packages, this package offers an easy way to share additional information like photos, maps, or a blog with your audience. The Online Presence Plus Web Design Package costs $1099. Additional design work like logo creation, graphics or illustrations will be charged separately. Compared to our other web design packages, this package is the best way to customize your website so that it is unique to you.